One of the lesser known features of Gulp is the Babel support introduced in version 3.9 of the CLI. By the way, Babel is the de facto standard ES6+-to-ES5 transpiler. This feature is vaguely stated in the release’s change log on GitHub. But what does it actually mean? In short, rename your gulpfile.js file to gulpfile.babel.js, install the Babel NPM module at the project level (npm install --save-dev babel), and begin leveraging ES6+ language features in your Gulp tasks. To demonstrate what was described above, see my GitHub repository here for a very simple example; and, if you’re expecting feature parity while following along in this blog post, Visual Studio Code 0.7.10 was used on Windows. If you’re using Mac OS X or Linux, version 0.7.0 provides the equivalent feature set. More information on the version differences is available here. Finally, the Node.js and Gulp versions being used are 0.12.7 and 3.9.0, respectively. 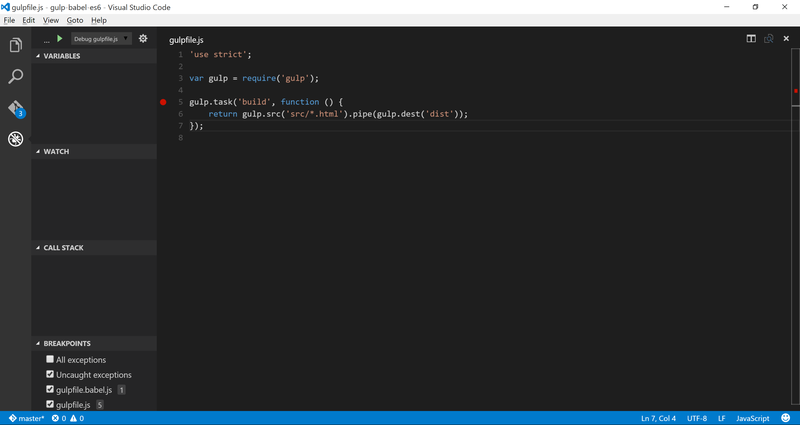 Now that we’ve addressed a few housekeeping items, how would one debug an ES6-enhanced Gulp file in Visual Studio Code? Truth be told, there is a little bit of configuration required before it will work. More specifically, there are 3 files with which we must become familiar. Create this file within the aforementioned .settings folder as well. 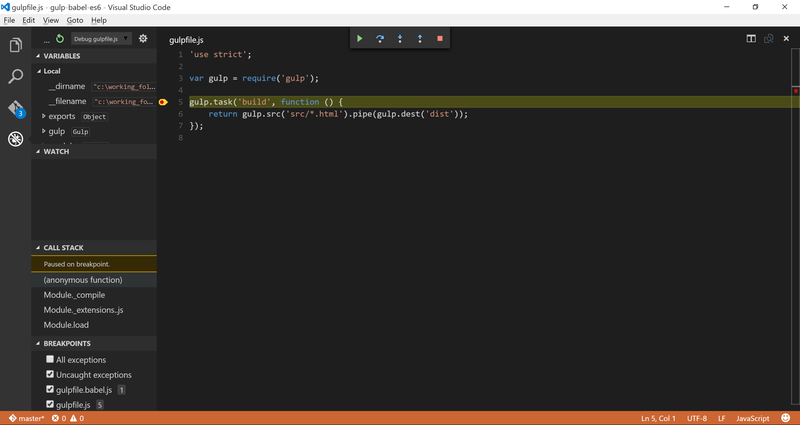 This file will be used to instruct the Node.js debugger how to behave. The entry point of the debugging session is defined in the program property. As an optional step, it’s a good idea to use a descriptive string in the name property. It’s what will appear in a drop-down list to the right of the green Play button on the Debug panel of the editor. 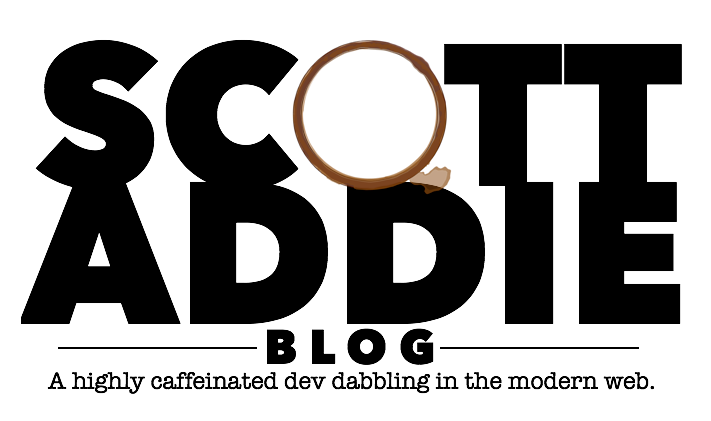 One final tidbit about the gist below revolves around the purpose of the args property. It’s here that we’ll pass the name of the specific Gulp task to be executed. In this case, the task name is “build”. Finally, click the green-colored Start button. Notice that the program execution will pause on the breakpoint which was set. Because watch mode was requested in the tasks.json file, rest assured that whenever you modify gulpfile.babel.js, Babel will immediately regenerate gulpfile.js. Pretty cool! 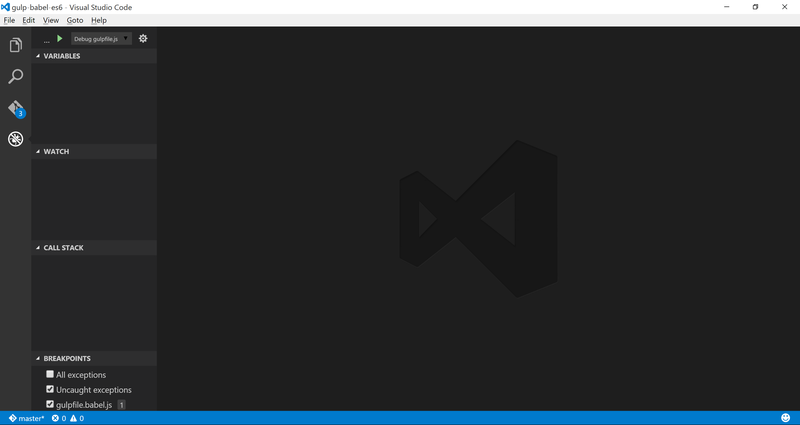 As always, I’m curious how other Visual Studio Code users have dealt with this particular problem. Please leave some feedback in the comments section below. I’d also welcome any suggestions for improvements to the approach I described above.